Hello, I am Horace Winters a native resident of Texas City/Galveston, TX. I currently reside in Galveston, TX. In my youth I attended GISD/LMISD and graduated from the former Lincoln High School in La Marque, TX. As an adult I attended Prairie View A&M College and graduated from the College of the Mainland in Texas City, TX. I later served two years in the United States Army. Family: Horace is the son of the late Johnnie and Samantha Winters, and is happily married to Shelia Winters with son Raphael James. Spiritual Goals: Horace’s spiritual goals are to encourage others to accept the gospel of Christ and live a life as to inspire others to the church; also to live peacefully with all men. 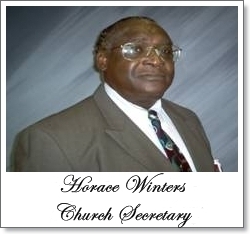 Horace currently serves as the full time secretary for the Church of Christ at Westward Ave. He also teaches youth classes on various occasions, serves as song leader, and drivers for the Van Ministry.